Only 5 minutes from Piazzale Michelangelo, in the highest part of Florence, is situated a church of Roman origins whose splendor is rivaled only by the Baptistry. 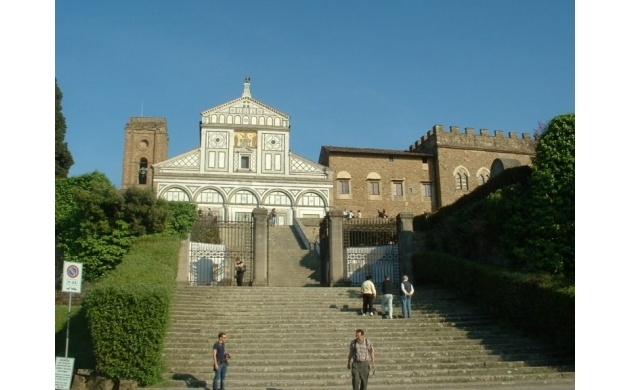 The Basilica di San Miniato a Monte is in fact located above the Piazzale and from its stairs one can see all the way out to the furthest confines of the city of Florence. The great height at which the church is located, combined with its marble facade, allow for a kind of play of light that is unique in its kind. 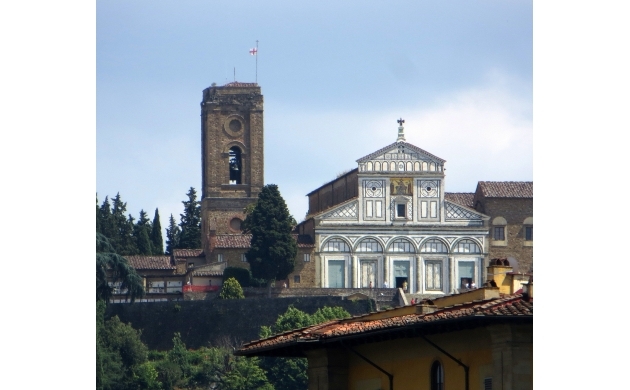 The church takes its name from the first martyr of Florence: Saint Miniato. An Armenian prince (or perhaps a Greek merchant) on a pilgrimage to Rome, he came to Florence in 250 AD where he decided to begin his life as a hermit. Killed during the anti-Christian persecutions during the reign of the Emperor Decio, he became a saint after the peculiar events after his death. According to the story, the decapitated martyr carried his own head over the Arno to the grotto on the Monte alle Croci where he died - in exactly the same spot where the Basilica is located today. A small sanctuary was initially erected in this spot and then later, in the 13th century, a chapel was built. The saint's remains are found under the Presbytery of the church, inside a crypt that dates to the eleventh century. 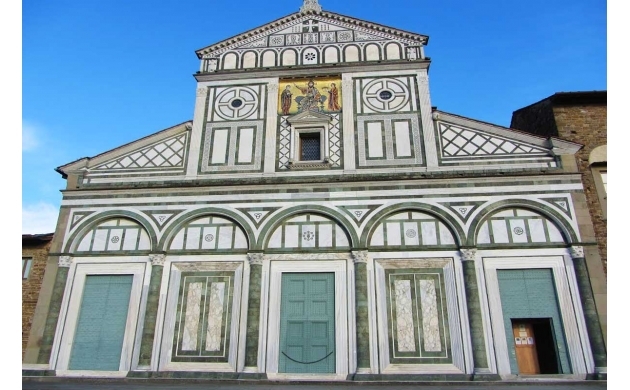 The facade of the basilica is decorated with colored marble in the style typical of Tuscan Romanesque churches. White marble from Massa Carrara and green marble from Prato alternate according to precise geometrical rules, in the same way that churches such as the Basilica of Santa Croce, Santa Maria Novella, and the facade of the Duomo were later decorated. In fact, the Basilica of San Miniato was the model from which a great majority of the florentine artists and architects took their inspiration when creating the most magnificent religious monuments of the city. Above the 5 large doors of the church (only three of which are real) is a mosaic with a golden background that depicts Christ with the Madonna and Saint Miniato. Higher still, on the front of the church where normally you would find a cross to symbolize the Christian faith, is placed instead a golden copper eagle clutching in its talons a bale of wool: the symbol of the 'Arte di Calimala' (the art of the weavers), one of the most powerful of the Major Arts that administered the city. 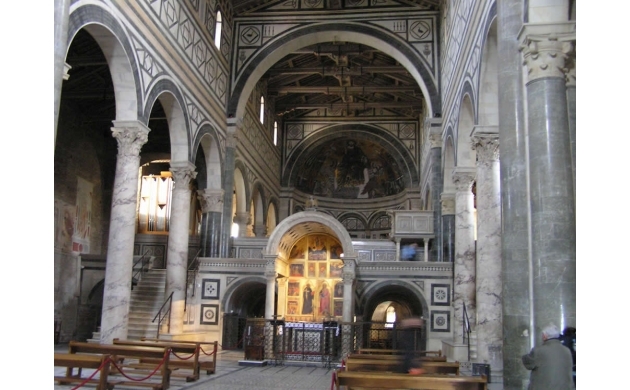 In 1288, the Arte di Calimara was designated as the administrator of the basilica and all of its economic concerns. It was was for this reason that the clergy and the administrators of the time granted the concession of placing an eagle on the church in place of the cross. The bell tower of the church of San Miniato has a somewhat peculiar history. After collapsing during some restoration works during 1499, it was used as a defensive fortification during the siege of Florence. Michelangelo designed the system of defense that in 1530 was able to defend the newborn Florentine Republic from imperial troops. To protect against the invading forces, Michelangelo covered the external walls in mattresses and bales of wool, placing in the tower two canons. After the war, the bell tower was finally able to be finished in 1535, although the final result was arguably not the best - seeing as the structure of the tower still shows signs of its bellicose history. This is the fist part of a small study we've dedicated to San Miniato. In a few days you'll be able to read the second part - so stay tuned!